Unless you manage to somehow avoid all health-related news, you probably hear a lot about protein these days. 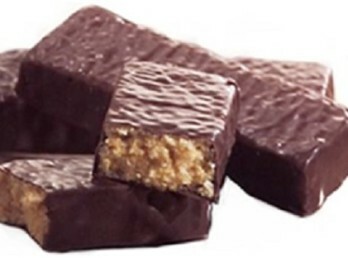 And the obsession is real: it seems that you can’t even walk into a convenience store without seeing a large assortment of protein bars, snacks, etc. In fact, just about every type of convenience food including cereals, pasta, and even ice cream (yes, really) have versions labeled as high protein. Among dieters, protein is constantly being promoted as the secret to weight loss, and diets like Paleo and The Zone emphasize protein as a central part of their nutrition plan. Even Weight Watchers recently changed its point system to reflect the importance of including protein in your regular meals. But how much protein do you really need? The truth is that there is no one definitive answer—just like total calorie intake and workout frequency, it depends on your own personal goals. Many people who don’t prioritize protein in their diets cite the basic recommendation to consume .8 grams per kilogram (or about .36g per pound) of body mass. This means a 150 lb (68kg) person would aim to eat about 54 grams of protein per day. Yet what this recommendation isn’t clear about is that this is the minimum amount of protein needed per day to prevent protein deficiency and to keep your body functioning properly. It’s not necessarily optimal, and definitely doesn’t take into account other factors such as achieving top athletic performance, weight loss, muscle gain, etc. That’s why this standard recommendation doesn’t make sense for most active (or even fairly inactive) people. In fact, if you’re looking for a general rule of thumb for how much protein to eat as a relatively active, healthy adult, it is recommended you eat closer to 2.2g per kilogram, or around 1g of protein per pound of bodyweight per day. But that’s just a starting point. If you want to get even more intent-specific, we’ll take a look at different goals and the recommendations for each. If you’re trying to lose weight, you undoubtedly want to focus on losing extra body fat—not your hard earned muscle. Because of that, it’s incredibly important to keep your protein levels high so that your body can maintain as much muscle as possible even while restricting your calories. As a bonus, keeping your protein levels high when dieting will help fill you up and keep you full longer—making dieting a little less painful. When most people think about what it takes to build muscle, they tend to focus only on protein, downing protein shakes whenever they get the chance. Yet the truth of muscle building is that while there’s no doubt that protein is important, you actually need to focus more on carbohydrate consumption (especially post-exercise) and just consuming more calories in general to stimulate muscle growth. If you run long distances, compete in triathlons, or regularly go for 50 mile+ bike rides, you can pretty safely consider yourself an endurance athlete. Since your body is going through a lot of fuel (a.k.a. burning calories) during long bouts of exercise, in general this means you’ll need higher stores of carbohydrates than you would if you were mainly strength training or doing HIIT workouts. And higher carb = less protein. If you mainly lift weights, perform calisthenics or gymnastics, or do short, quick HIIT workouts (or a combination of all of those), you’ll need a bit more protein to maintain and build muscle and keep body fat levels down. Your level of protein may vary depending on your body type: if you’re naturally broad and thick, you’ll most likely need a higher protein, lower carbohydrate diet, and if you’re built more muscular and athletic you’ll be able to handle slightly more carbohydrates and less protein. If you’re naturally thin and have trouble putting on muscle, you’ll most likely want to eat similar to an endurance athlete. Dairy such as cottage cheese, Greek yogurt, cheese, milk, etc.